Paris has climbed to the top of the world‘s priciest city for expatriates, tied first with Singapore and Hong Kong according to a survey that named the capital of strife-torn Venezuela as the cheapest. 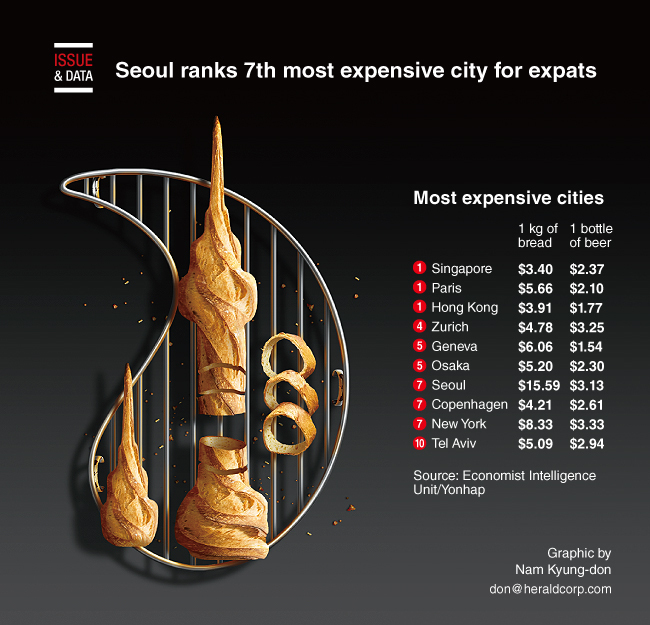 South Korea’s capital city Seoul ranked as the seventh most expensive city. The average price of 1 kilogram of bread was found to be $15.59, while in Singapore it was $3.40. Currency appreciation, inflation and devaluation as well as political upheaval played a part in this year’s rankings, said the Economist Intelligence Unit, which surveyed 133 cities worldwide. It compared 400 individual prices across 160 products and services, including foods and drinks, clothing, home rental, transport, schooling and recreation.